The white, reflective barrier protecting our northern polar region from the heat-amplifying effects of human-caused warming took a severe blow today. 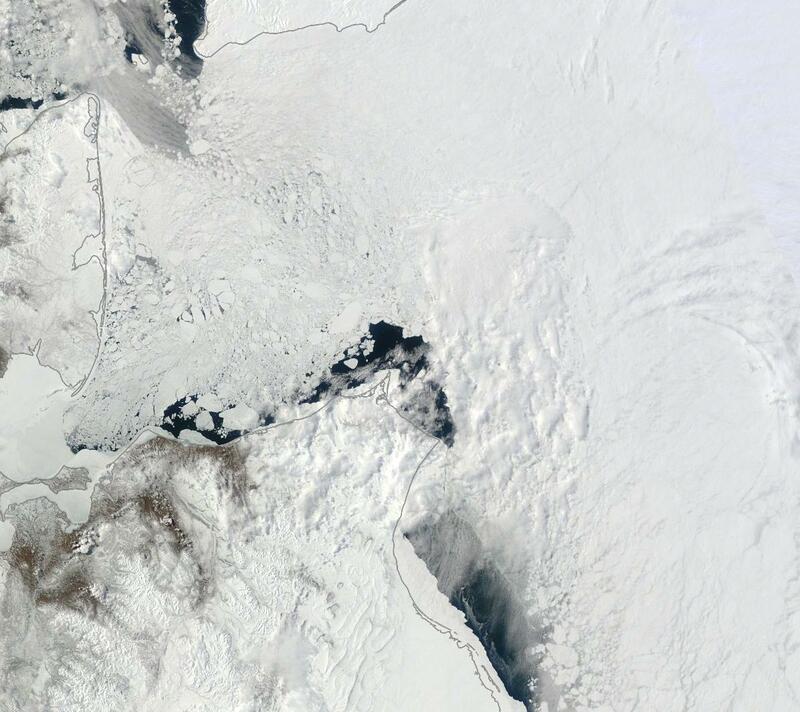 The National Snow and Ice Data Center’s sea ice area measure essentially fell off a cliff as values plummeted by more than 286,000 square kilometers. That’s an area of ice the size of Nevada lost in a single 24 hour period. A state-sized region flipping from white, reflective, cooling ice, to dark, heat-absorptive water. Overall, the sprawl of sea ice fell to 9,984,000 square kilometers or a negative 907,000 square kilometer anomaly vs the already low 1979 to 2008 mean. 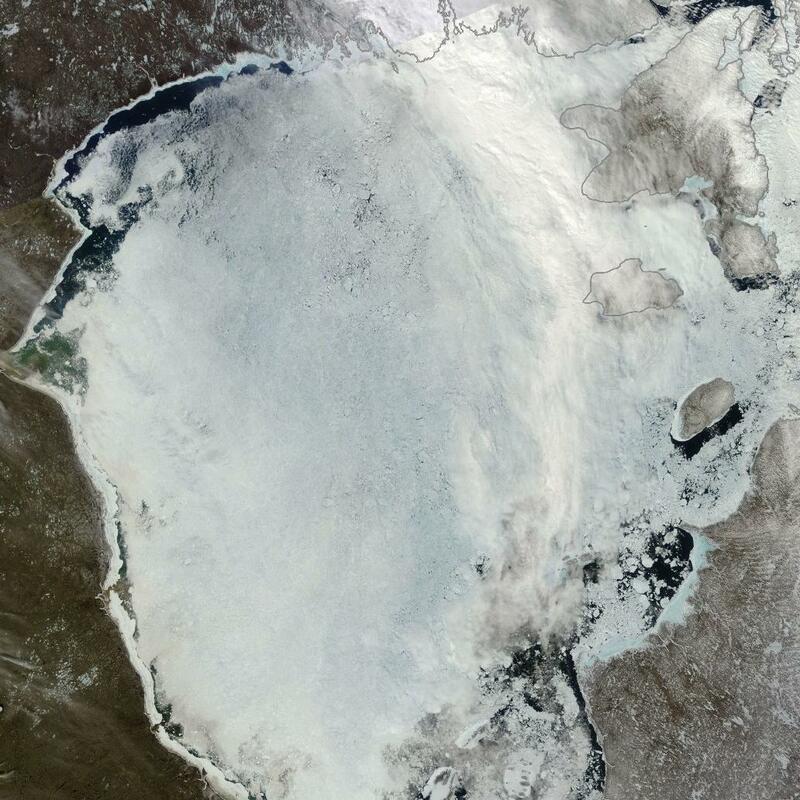 The fall was rapid enough to bring sea ice area to within striking distance of new record lows for the date. Should the nose-dive continue for just one more day, the measure’s lower range will be shattered. Since May, weather conditions in the Arctic above the 66.5 degrees north Latitude line have remained somewhat warmer than usual. GFS averages have ranged from +1.5 to -0.3 C when compared to the, already warm, 1979 to 2000 average. And, in general, values have typically hovered in the +0.5 C range for the entire Arctic. This temperature anomaly range is, however, a major fall from the extreme polar amplification we saw this winter on the order of +4 to +6 C above ‘normal’ temperatures during the months of January and February of 2014. It is the same relative winter-to-summer draw-down in anomalies we would expect come summer as the heat overburden goes to work doing the physical heavy lifting of ice melt rather than simply warming the air. In essence, as atmospheric and ocean temperatures approach the 28 F melt-freeze line of sea ice, energy, instead, is dumped more and more into ice melt. So though Summer is still quite a bit warmer than Winter in the Arctic, the pace of atmospheric warming in the winter is much greater so long as temperatures remain below ice-melt thresholds. 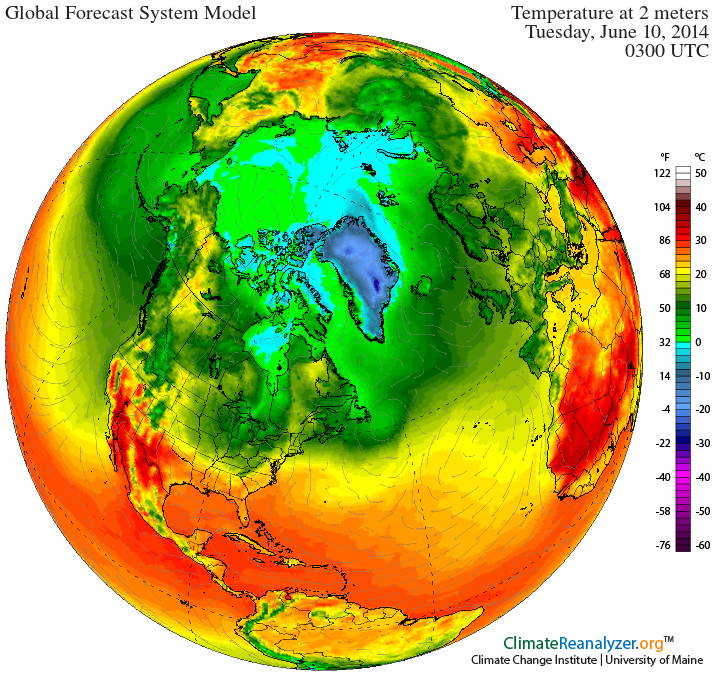 Extra dangerous and amplifying Arctic heat comes from many sources. Not only is the atmosphere over the Arctic more heavily burdened with heat-capturing gasses than the rest of the planet (currently at about 405.5 ppm CO2 and 1910 ppb methane as measured at NOAA’s Barrow Alaska station), high amplitude jet stream waves continue to deliver heat in the form of southerly warm wind invasions even as the ocean upon which the thinning ice rests draws ever more energy from an immense volume of warming water. Expanding holes in the ice, a darker, greener, Arctic environment, a rain of soot from massive wildfires burning at the Arctic’s gates — all contribute to overall warming in the Arctic system. How this heat is delivered to the sea ice can take many forms. The first, and most obvious, is through direct solar heating of the ice itself. Such insolation heating requires both clear skies and warm air temperatures for greatest impact. In these ideal conditions, melt ponds can proliferate, greatly reducing sea ice albedo and further weakening ice for large melts later in the season. And recent studies suggest that widespread melt pond formation played a key role in both of the record melt seasons of 2007 and 2012. But for 2014, melt pond formation has been relegated to the ice edge boundary along the fast ice near Russia, in regions of the Canadian Arctic Archipelago, and in Hudson Bay. Large areas of cloud cover have persisted throughout the Arctic preventing a much more widespread occurrence of melt ponds. This high degree of cloudiness is likely due to the changing Arctic itself where increasing encounters between hot and cold are veritable cloud and mist generating machines. Such changes bear out in paleoclimate observations where proxy values show a more ice free Arctic is a much cloudier Arctic. So if clouds interrupt solar insolation in a melting Arctic, then what other mechanisms go to work to deliver heat to the ice? ‘Fate,’ as the saying goes, ‘is not without its sense of irony.’ For water in all forms, including the low-lying clouds which are fogs and mists, is likely to play an ever-increasing role in Arctic melt. These emerging heat delivery mechanisms can simply be summed up as follows: warm wet winds, warm water upwelling, and warm rivers. Warm Wet Winds blow from south to north and increasingly invade the Arctic as tundra melts and sea ice retreats. As summer temperatures at the Arctic boundary increase due to human forcings and related amplifying feedbacks, these warm, southerly gusts bear with them an ever-increasing moisture content. And since water has 4 times the heat capacity of air, winds laden with higher volumes of moisture carry much more heat to melt ice than the drier, colder winds of yore. When such winds contact the ice, a form of condensation mist is wrung out of the air due to temperature differential. The mist directly contacts the ice and delivers its x4 heat capacity to the ice surface. It’s a phenomena that many coastal residents in the northeastern US are well familiar with — something they call snow-eating fog. During late spring of 2014, warm, wet winds were particularly prevalent in the region of the Bering and Chukchi Seas. These winds weren’t much warmer than sea ice freezing temperatures — ranging from 28 to 40 degrees F. But they picked up moisture in a large south to north synoptic pattern, dredging up heat and water from the temperate Pacific to dump it on the Arctic sea ice. The result was great gusts of mists and fogs eating away at the ice edge week-after-week. 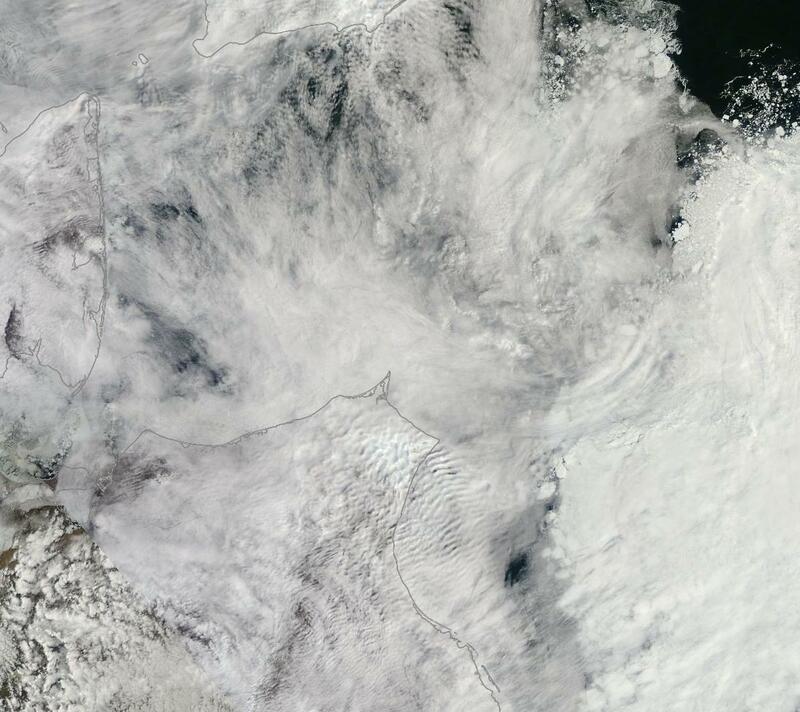 In the above satellite image sequence (LANCE MODIS), we can see the drastic effects of prevalent warm winds. The top image is from April 25 of 2014, the bottom from June 2nd. In the top frame we can see the beginnings of mist and cloud formation at the ice edge along the path of persistent south to north wind flow. By June 2nd, this warm wind pattern has melted most of the Bering and Chukchi sea ice even as it intensified to a misty, cloudy maelstrom chewing away at the ice edge. A more intense kind of a warm wind forcing can come in the form of a warm storm. These storms typically emerge from the south carrying with them a high degree of heat and moisture. A combination of rain, strong winds and increased wave action over sea ice can have a severe effect during a warm storm as was seen during the Great Arctic Cyclone of 2012. Such storms are likely to become more prevalent as the Arctic continues to heat up. And these systems can also generate a kind of warm water upwelling that eats away at the ice from below. Warm Water Upwelling is an especially powerful force to melt ice that sits on a warming ocean, particularly when the ice is as thin, broken and mobile as we see in the Arctic today. Impacts from warming and upwelling deep ocean waters have been both extraordinary and increasingly visible to major glacial systems in Greenland and West Antarctica where numerous ice sheets have begun an irreversible plunge toward the oceans. In the Arctic, heat typically pools in deeper layers and at the near-shore below-surface boundary along the continental shelf. The ice rests in a zone of colder water at the surface. Atmospheric patterns such as persistent and strong high and low pressure systems can occasionally tap this deeper water heat through a mechanism known as Ekman pumping. The way this works is that a large-scale swirl of air creates a kind of suction effect on the sea surface. In cyclonic storms, Ekman pumping causes upwelling to occur at the center of the storm and down-welling to occur at the edges. In high pressure systems, upwelling occurs along the edges while down-welling occurs at the center. The effect this has on sea ice is that storms will tend to spread the ice out and thin it at their centers while high pressure systems will tend to pull the ice edge in and concentrate the ice. In addition, the upwelling at the edges of the anticyclone can add melt stress, especially in more shallow coastal basins, even as melt stress is added along storm paths in which warmer waters may have ventured closer to the ice bottom. During the last week, a persistent high pressure system formed over the Beaufort Sea. It sat opposite a set of cyclones that formed near the Kara. The anticyclonic pattern of the high drew in ice from land-fast moorings in the East Siberian Sea even as warm upwelling and loss of albedo generated warmer surface temperatures in an expanding polynya zone — pumping out a burst of ice-eating mists. The anticyclone expanded into the Laptev where a similar edge draw and surface warming effect was visible even as the wind patterns between anticyclone and cyclone converged to amplify the northward retreat of ice. In the top LANCE MODIS image frame we see East Siberian and Laptev seas already suffering ice loss and break-up due to a series of warm wind outbursts from the Asian continent on May 15 of this spring. In the bottom frame, we see today’s sea ice coverage dramatically reduced after a week of extreme ice damage due to anticyclonic recession and related edge upwelling. 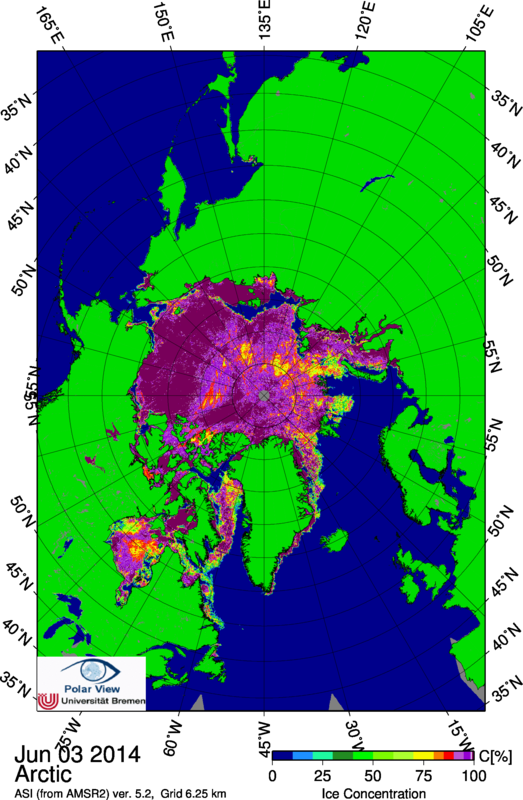 As a result, both Laptev Sea ice and East Siberian Sea ice are well into record lowest ranges. Warm Rivers also typically provide a strong pulse of heat to the Arctic through spring and into summer. As the Arctic lands thaw and the large continents warm, water flows from thawed rivers increase. In recent years, Jet Stream wave amplification has combined with warming temperatures in the region of 55 to 75 North Latitude to increase storminess and rainfall intensity. As a result, higher volumes of warmed waters flood north into what was once the ice sanctuary of the Arctic Basin. The pulse of water is generally enough to disintegrate land-fast ice and speed the ice melt further offshore. Though large warm water pulses are not yet visible, regions to watch for 2014 will be the Mackenzie Delta and the mouths of the Kolyma, Lena, Yenisey, and Ob rivers. Major rainfall events in Siberia have been ongoing over the past week and will likely generate increased volumes of warm water flow for the Lena and Yenisey rivers particularly. It is also worth noting that much warmer than average conditions have spread over the Mackenzie and Ob river basins. Today’s weather shows a continued building of the high pressure ridge over the Beaufort with GFS model forecasts predicting the ridge will remain in place over at least the next seven days. Persistence of this ridge pattern will continue to draw the ice in from the East Siberian and Laptev Seas even as warm winds over the Chukchi are reinforced. Sea ice totals may further be drawn down from rapid melt proceeding in both Hudson and Baffin Bay. Melt in these areas has lagged behind the larger Arctic somewhat, so current near record low totals are yet higher than they would otherwise be. Meanwhile, model runs show the Arctic steadily devolving into a kind of melt soup where atmospheric temperatures push into an above-freezing range for sea ice over the majority of the Arctic even as shore regions of Yakutia and the Mackenzie Delta are forecast to see temperatures in the mid 60s and 70s. These readings are in the daily range of +0.3 to +1.9 C above the 1979 to 2000 average for the entire area above the Arctic Circle and are predicted to hit local spikes from +4 to +18 C.
It should go without saying that a 70 degree reading in early June on the shores of the East Siberian Sea in the high Arctic is a clear sign of human-caused climate change gone nuts. And we are likely to see these and higher readings as spring proceeds into summer. So though general cloudiness over the Arctic may continue to suppress melt pond formation, there likely remains enough heat baked-in to keep testing new record lows for sea ice. Even under cloud cover, dangers to the sea ice abound in the form of warm winds, warm storms, warm water upwelling, and a growing heat pulse from warming Arctic rivers. Amplifying heat and a growing number of ways in which that heat can be transferred to ice creates an ever-expanding risk for ice free conditions. Under such a regime, unexpected and extreme events are increasingly likely. UPDATE: According to reports from NSIDC and Cryosphere Today, negative Arctic sea ice area anomaly for the date grew to 988,000 square kilometers below the average for June 3rd. This represents an additional loss of 179,000 square kilometers, which is larger than the combined land masses of the UK and Croatia (or roughly the size of the state of Missouri). This most recent plunge pushes 2014 sea ice into record low range as it essentially ties values for both 2011 and 2012 on this date. Any single day loss greater than 120,000 square kilometers for tomorrow will extend 2014 losses into all-time record low range. In total, the plunge over June 2-3 represents 465,000 square kilometers or an area larger than the combined regions of California and Maryland. It is worth noting that weekly losses in the range of 500,000 square kilometers are considered extreme. We have instead witnessed a near 500,000 square kilometer loss in just two days. As an additional note, it’s worth sharing the observation that while high pressure systems and warm winds have placed extreme melt pressure and caused the ice edge to rapidly recede in the Chukchi, East Siberian and Laptev seas, ongoing cyclonic action in a rough triangle from the North Pole to Greenland to the Kara Sea has resulted in a great breaking, thinning and dispersal of ice in this region. The cyclones in the area, though weak, have generated enough force to greatly disperse the ice and, perhaps, to access warmer waters just below the ice in sections where ice has repeatedly expanded and retracted over recent months. Large patches of sea ice concentration of less than 75% in this zone make it very vulnerable to any additional heat and melt forcing. So it appears the Arctic is split between weather forces — with cyclones dominating the sea ice between the North Pole, the Kara, and the coasts of Greenland and with high pressure systems dominating the Beaufort and the Laptev. Forecast higher temperatures injected into what is already a strong melt regime continue to generate high risk for rapid melt. Your comment is plenty of comment. Tried to keep the commentary sparse for this one. How much critical information with predictive power can a scribbling human get into a single sentence? Only trouble is it plays to a US audience, I have no idea how big the state of Nevada is? How many Wales is it? Or Scotlands? Or Londons? I refer to Yakutia at least as many times as I refer to Nevada. The global perspective includes the US, as do climate impacts. I think it’s a problem with these rather arbitrary geographic comparisons in general to be honest. On a slightly more serious note – how sure is it that the area loss was that sudden? My understanding is there is a certain amount of noise in the signal from clouds and the like? That – and the fact that the measurements are typically taking a threshold value, which is to say a large area might have just happened to edge past a transition point to record as ice free? In that context, day to day fluctuations perhaps don’t carry quite so much weight – the sustained progress is the more key (and looking at the AMSR and AMSR2 concentration maps, I wouldn’t be surprised if this is sustained). Nevada is somewhat larger than the entire United Kingdom of Great Britain and Northern Ireland. And… now it seems a lot bigger to me! Thanks. Germany is only a bit larger at 330,000 square kilometers. Two day loss dwarfs Germany. God, the Laptev is still in rapid recession for today! Brutal loss. For you, ccg, I’ll make the next post with size comparisons to a nation in Europe. Given the trends, it looks like we may be at new record lows for the date. Actually, I wonder if sq km (or some multiple of) would give an easily comparable benchmark? While I must admit I can’t picture sq km very well, anyone with basic knowledge of the general size of the pack at different times of the year can follow it numerically? Another thing I’m wondering – the AMSR ice concentration seems to suggest quite a few areas with already patchy ice – suggesting we could ultimately go pretty damn low without the favourable weather of last year? (I don’t think total loss, or even 1 million sq km is really on the cards this year though). It’s really hard to tell what’s in the cards. My opinion is that weather very favorable for melt would be required to get to near zero this year. I think moderate weather gets just below or near a new record low. I don’t think we’ll see 2013 values again for summer without massive Greenland melt/ice release. This year appears to be trying for an extraordinary start. 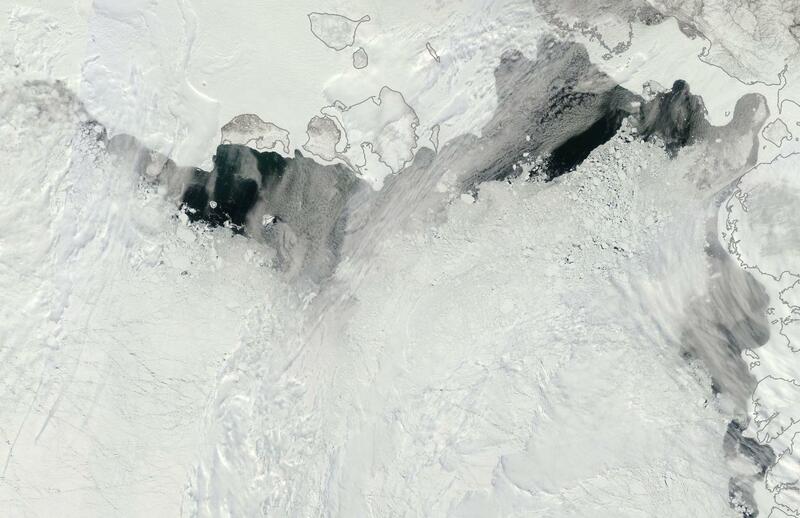 The Laptev gap could turn into a partial separation from the fast ice before it melts. All that dark open water in the midst of the northern ice is a huge heat trap, which will compound losses later in the season. Who needs melt ponds when you have dark, open ocean instead? As for dark open ocean – fragmentation also could increase melt speed if it occurs during the melting season (for 2013 when it occurred in the winter it seemed to increase heat exchange to the atmosphere, enabling the ice to thicken at the last minute). While in recent years multi-year ice has clawed back some ground – 2007 remains the gold standard for showing how much of it can be destroyed if the conditions set up right (and we’ve added >15ppm more CO2 since then… ignoring all else). Yeah, I’m looking at the AMSR and thinking how much looks similar to the great lakes – which go totally ice free (and are perhaps lagging a bit this year – important for counts including them). Although compaction from wind and so on and move things around and change the picture, it isn’t hard to picture a lot of that ice going if it’s already losing concentration so early. There is of course also the melt pond correlation – but I do wonder how strong any factor can be predictively in a system that is changing as fast and dramatically as this one. As the ice thins out the last steps the behaviour and rules of the whole system can be altered all the way down – I mean – it’s always going to require x energy to melt x amount of ice, but all sorts of other things can change (for instance fragmentation increasing surface area available for energy exchange – the effects of which would seem to depend on the time of the season). But I can’t really claim to know a lot about sea ice, it just happens to be the first wake up call I noticed (2007). There are so many other things happening now that weren’t back then, one has to think that not only is our goose in the oven, but the temperature is climbing nicely (so to speak). El Niño gives everything a good northward shove. And you’re right that Wadhams is calling for a 2015 near zero summer. Over at TAIB they talk about winter power. Warmth during winter as we saw this year can result in far less ice resiliency during summer. The ice is higher heat content, what locals call Roten ice. Kind of like a hollow egg shell ice of this variety can simply shatter and disassociate. It seems particularly vulnerable to compaction. I think we’re seeing a degree of that in the Laptev now. In this video clip Wadhams seems to be suggesting a link with El Nino – I’ll see if I can find out a bit more. The whole clip is worth watching if you take Wadhams opinions seriously (I do). He’s playing up methane, playing down the Antarctic, and playing down the scope to do anything, even as he plays up the catastrophic extent of anticipated impacts. And doing it all incongruously cheerfully! I take Wadhams very seriously. And he does link Niño to Arctic ice melt forcing. We have a reason to be concerned about Arctic methane emission. Understanding of the vulnerability of the source is not commensurate to the scale of the risk, in my view. In my opinion, 2015 is a bit aggressive. I put 2014 at 30 percent near zero ice with El Niño and current weather. Might up it if we keep going vertical in June and hit new daily lows. 2015 with El Niño at 30 to 40 percent depending on end summer and winter conditions. The caveat is that extremely favorable weather for melt over the summer is certainly capable of getting us in the near zero range during any year going forward at this point. By 2020, we are probably in a range of very high risk for a near zero ice year. Paul is even more aggressive than Wadhams. One year, though, he’ll end up being right. Yeah but little credit if you call it every year as you’re bound to be right eventually. 2015 if memory serves is the earliest likely interpretation of some of the PIOMAS extrapolations – the Maslowski model suggesting 2016 +/- 3 years if memory serves (making many people confident about “by 2020”). 2015 does feel aggressive (and I don’t see any way one could be confident in predicting it, too much noise in the signal), but far from impossible. The escalation in extreme weather this early on in the process is rather concerning when one considers the magnitude of changes still in the near future pipeline. That’s why I tend to rely on risk assessment — potential for total loss during a given year — rather than attempting to call out a single year as final melt year. PIOMAS exponential hits 2015-2016 as near zero currently. It’s worth noting that PIOMAS exponential indicated 2012 as the zero year from the 2007 start point. So the exponential curve wags a bit during peak melt years or periods. It’s worth noting we saw steady and strong volume losses for 2010, 2011, and 2012 with 2013 as a pseudo-recovery year. Er, from 09:15 is the bit about El Nino such as it is – sorry, seems WordPress didn’t honour the link for youtube being set to start at that point. About the sea ice extent discussion. I feel Tamino generally has a realistic view on things based on both statistical significance and a good eye. These days its trying to estimate minimum for this year. I think we will be closer to 2020 before we see a practically ice free Arctic. It takes 80 calories to melt a gram of ice in Bahstin, Bangalore, or Baghdad. When you put the same 80 calories into a gram of watah, the temp of the watah goes to 80 degrees F.
There are plenty of methane gas molecules in the Arctic Ocean sea bed just “yearning to be free,” as in the Statue of Liberty. There is lots moah methane gas in the permafrost, too. I ain’t worried about big trouble in 2030 or even 2020, Mama. I be worrying about – like this October. Sorry if this comment is a bit long. Throw it out if it is too long. Things are definitely heating up, Robert. Your posts are invaluable. They deliver hard scientific truths in a very friendly and inclusive manner — first rate prose too. My comment offers a parallel and psychological thrust. This unfolding condition we call ‘climate change’ is the most urgent issue or news story ever to face humanity. It should be the lede (lead) story in every news outlet, whether print, digital, or broadcast. The finality of its impacts cannot be understated. As news, it is something worse than a war, or a natural calamity. A climate rendered dysfunctional will result in hundreds of millions of casualties, starvation, and total collapse of social and economic systems. That’s just on the physical side. On the emotional and psychological side, anger, frenzy and panic will be the norm. In such a state, the human psyche will quickly overload. I am sure that governments are aware of this, which is partly why they have stood relatively idle for many years while fossil fuels are burned and destroy earth’s climate. Some sort of whistleblower leak type of action might cause the media and officialdom to react, or over react, to help ratchet up the alarm? We are faced with a dangerous mass psychology of denial at a critical juncture of human existence. From history, I bring up Nazi Germany as an example of widespread catastrophe sanctioned by its government. At the end of its reign, many of its architects could not face responsibility for carnage it allowed, not its aftermath. Hitler, Goering, the Goebbels’s, and others — instead killed themselves. So I must wonder what today’s business and government leaders have as a fallback position when the climate, and all of our life support systems go all to hell. How many of them will take an early exit? How will their psyches stand up to the look of questioning horror in the eyes of their family and children? Will they swallow lethal L-pills or inject by syrette? Or will they just whimper until rigor mortis sets in? Possibly there are agreed upon static denials already in place. I would like to know what they have planned. Think about it, they have protocols for almost every other conceivable scenario. I bring this up because, aside from scientific input, another level of alarm and resistance is needed to, at least slow this (avoidable?) doom. Our present dilemma unfolded over a few decades — day by day and emission by emission, while the atmosphere/biosphere filled up and those in charge of public safety stood idle. My ‘Doomsday Clock’ reads about a quarter past midnight. A few more speculative scenarios and appeals are posted on my highly unpopular ClimateLeaks blog. Please feel free to post as many long and thoughtful comments as you like, DT. I’d compare this more to other collapse or potential collapse scenarios. Deforested Japan, Easter Island, Rome, the Norse in Greenland when the warm period ended, Tikopia, etc. Kill the scared cows and act responsibly or face downfall. That’s where I think we are. Or, perhaps, as some believe we’ve already lost our chance and pushed things too far. We won’t know unless we try a strong correction and intervention now. Such a poignantly informative post. Wish it was available a few years ago when the denier crowd was chirping about cherry-picked data showing an “increase” in Arctic sea ice extent which conveniently ignored the volume metric and long-term climatic trends. I think they’ve learned their lesson RE Arctic sea ice. They stay away or they get beaten about the head with new record lows. Although I’m sure that won’t keep Watts from posting the 1950s picture of submarines sitting in melt ponds at the north pole and other unrelated nonsense. June 02, Colombo: Over 7,000 people were affected and 15 people have died in Sri Lanka as heavy rains caused flooding and landslides in several areas in the island, the Disaster Management Center (DMC) said. The western and southern regions experienced heavy rains with more than 100 millimeters within about an hour on Sunday and many areas in Western Province have been flooded due to the torrential rainfall, the DMC said. The Meteorology Department predicted heavy rainfall – more than 100 mm in some areas within next 24 hours. Watching that monsoonal edge will be interesting with all the heat and dryness entrenched over India. It is hitting Sri Lanka pretty hard, but not hardly anything in the Bay of Bengal or Bangladesh for that matter. Even south India’s rainfall forecast over the next 11 days is mostly rain free. Did you cover the last monsoonal disruption in 2009? Some, but I don’t remember many details. The good ole’ PETM – the climate of which we’re heading (back) towards at an ever increasing rate. But because the pace of warming was slower then, enough plants and animals had time to migrate (north) pole-ward, such that there were crocodiles swimming in the arctic ocean during the later PETM years. The extremely rapid warming this century will just decimate species all over the place, with far fewer eventual survivors than in the PETM and other warm ups (with perhaps the exception of the Permian). The beautiful scenes bring him and Charlton to tears. Our pre-NRA science fiction actor then said something like, “My God, what have we done”, or something to that effect. I think our descendants will have exactly this experience, and they will be very angry. It really pains me as a naturalist to realize all the species we’re likely to lose in the next few decades, especially in the tropics (at first). It’s beyond tragic. It’d be one thing for humanity to destroy itself, but to bring Nature down with us is the ultimate sin against creation, to put it into quasi-theological terms. The moral imperative is certainly there for us to be creatively proactive in Mother Nature’s defense. PETM + ice melt = Permian. That’s where we’re headed if we don’t get our act together soon. “PETM + ice melt = Permian”. I’d love for you to do an article on that in the future, as I don’t quite get the connection. Didn’t all the north polar ice melt in the PETM? No need to delve into it now – unless you really want to. But I recall really liking the series of articles you wrote on paleoclimate a year-ish ago. When people I’ve talked to start blabbing about how wrong models can be, I say, uh, we have ice cores and other proxy data going back millions of years to tell us what the climate was like. ‘Screw the models’ (not really, but it has an impact on them!). In short large scale fresh water flows from glaciers in a hothouse is an ocean killer on top of an ocean killer. What we are doing is probably even worse due to the velocity at which we push the climate system, as per Bob’s linked article above. When EPA Administrator Gina McCarthy announced new environmental rules yesterday to cut carbon pollution, she took a brief stroll down memory lane. “In the ’60s, when smog choked our cities, critics cried wolf and said EPA action would put the brakes on auto production, and they were wrong. Instead, our air got cleaner and our kids got healthier, and we sold more cars. Thank you to the folks at EPA. If you missed last night’s show, it’s amazing to see the cyclical nature of the complaints: every time policymakers rely on the Clean Air Act to protect the environment and public health, industries and conservatives have issued dire warnings, warning of economic doom and gloom. We are reminded time and time again that industry can’t do basic math. Ah. The typical ‘let’s make stuff up and then go beat it like a strawman.’ Yes, shutting down the coal and fracked gas plants that represent that 25 % and replacing them with renewables is a good thing. And the terrorism we’re trying to prevent is an all-too-real environmental horror show. The fossil fuel industry just can’t stand losing its hold over captive consumers and they’re willing to generate any kind of name calling or red herring to do it. Same old bag of tricks. Made up figures about jobs, and made up nonsense about terrorism. If doing the good thing was water and these guys were the horse, they would die of dehydration. That said, I think it’s important to separate the utilities from the miners and other FF interests. Utilities might be slow to act but generally they can adapt and get the support to do so. It is the FF interests that are the worst — and prior regulations have greatly reduced (internal) consumption of say, high sulfur coal. But it is doing little to curb overall emissions since those supplies are now just exported. Unfortunately the new regulations will do little to curb this. Then you get into the string of ifs. If this policy can aid in breaking the international deadlock on climate policy, then some of our net emissions, including those counted in coal exports, may go down. If China, if India, if Russia… Oh there’s a huge long list. The implications for geo-politics could be enormous. The so called “defense industry” can. Obama just handed them another Billion today, via a bunch of power hungry Poles who are still angry at a bunch of Russians who’s former Soviet grandparents committed crimes against their grandparents. Typical maneuver of Empire. Same was said about unemployment insurance. The denialists for that stated that nobody would ever work again. I really don’t understand who gives these babies a mouthpiece. Maybe they would never work again, given the opportunity. But that’s the whole point in exploiting people’s labor through capital equity, isn’t it? That is the only rational explanation. They would do such things, and perceive that all others would behave as they would. They don’t understand what a social conscious is. About two short hours ago I read the scribbler’s terse sentence. I haven’t thought of anything else since. Many years ago I was first on the scene of a gruesome & fatal two car head-on crash on the interstate near Comfort, Texas. I did what I could for the survivors & I performed competently & efficiently. After rescue personnel arrived, I walked in a daze to my truck & realized that I was covered in blood. I started sobbing like a baby. I wish that I could sob now, but I can”t. 3 June 2014 – New flash floods in northern Afghanistan over the weekend have affected thousands of homes and washed away agricultural land and roads, the United Nations Office for the Coordination of Humanitarian Affairs (OCHA) reported today, noting that the number of people affected by flooding nationwide now stands at 140,000. Jens Laerke, OCHA’s spokesperson in Geneva, told reporters that among the areas affected in the latest flooding are Faryab, Sar-i-pul, Balkh and Baghlan. “Initial reports from Faryab province indicate that some 6,000 houses have been destroyed, livestock has drowned, and agricultural land, roads and bridges have been washed away,” he stated. The heat dome won’t budge. The troughs are in fixed positions around it. Going to be a rough summer. I went to the Delta to cover the trial of 23 Yup’ik fishermen who had violated a ban on the fishing of king (or Chinook) salmon. In late June and early July, as many as 40 million of the fish have been known to migrate throughout the state, returning from the sea to spawn on gravel beds. They run so thick that the fish swimming on the outer edges of the river are forced onto the banks. King salmon, I am told, can weigh as much as sled dogs. But over the past few years, their numbers have dropped dramatically. By the beginning of the 2012 season, the Department of Fish and Game was alarmed enough to gather a panel of fishery scientists and ecologists from across Alaska to determine a response. They came up with seven hypotheses for the decline. Natural cycles are cited, but the report returns again and again to climate change. Rivers are breaking up earlier along their routes, sending more vulnerable juveniles out into the ocean. Changing ocean currents may be spreading disease. There are shifts in other species in the food chain upon which the salmon depend. Warmer waters are depleting the energy of the fish, causing higher mortality rates along the migration route. The impact of each of these factors is currently unknown. I thought that was an indigenous right. We just won’t spitting in the face of the people from whom we stole a continent will we? Robert, thanks for answering my question below the previous post. SK moved mountains with his word processor. Being able to match his pace wound be nice. Not sure SK had to research stuff so much to post it though, or worry about it being sifted through for errors or whatnot? I’m impressed that not only do you seem to be churning out so many articles (and recently quite a few fresh ones, as opposed to what I view as re-runs), but you also somehow manage to participate below the line too (ie comments). Me, I’m gradually withdrawing from online stuff, it’s proven much too inefficient a use of time to date for what I’m doing. It can certainly take a huge amount of time and effort. I look at the Greenland melt extent each day from here…. And then open up climatereanalyzer here…. and look at air temperature, sea surface temp (temp, anomaly for both). I also look at the surface wind and jet stream. From this I do a gut feel inference of vulnerability. Reanalyzer here….. (remind me to copy links when I mean to). Overall, the forecast for this week shows Greenland flashing hot at 72 to 96 hours, then cold. It’s been doing that all spring. That persistent Greenland high is troublesome, though. Greenland high and the high amplitude wave riding up to meet that ridge now looks like potential trouble. It’s even left a cut off low staggering around near to US east coast. If the flow meanders enough the low will go retrograde and the mid ocean high will form a huge dome with the one over Greenland. Then you get a very large heat-amplifying synoptic over Greenland. Not certain to happen. But possible bad scenario for melt this summer. The “Reanalyzer” has enslaved me also. It is the first thing I check in the morning followed by twitter. Here is a really good link (NOAA just hordes climate data like a champ) for snow extent data. This data alone shows an incredible warming signal on planet earth. It is often ignored in comparison to Arctic sea ice cover but still an important positive feedback. NOAA has some fantastic tools. It sounds cynical and paranoid but I wonder if under a GOP administration there could be budget cuts specifically aimed at shutting these services down in NOAA or NASA. This would be similar to what has happened in Canada and Australia. That “Pentagon not mentioning climate change” House Bill was really alarming/disturbing. They tried it under Bush. It would be worse if the conservatives gained power again. they probably missed their chance during the Bush43 administration. NDIC is great too. You’ll curse me for plunking these links down as they can consume your attention as well. Robert, it is still sinking in. If that doesn’t look like Hades & doomsday as well …? It’s a rough piece of info. And it’s June. We could see worse. Has any pattern set in in the arctic or is it too early to tell. 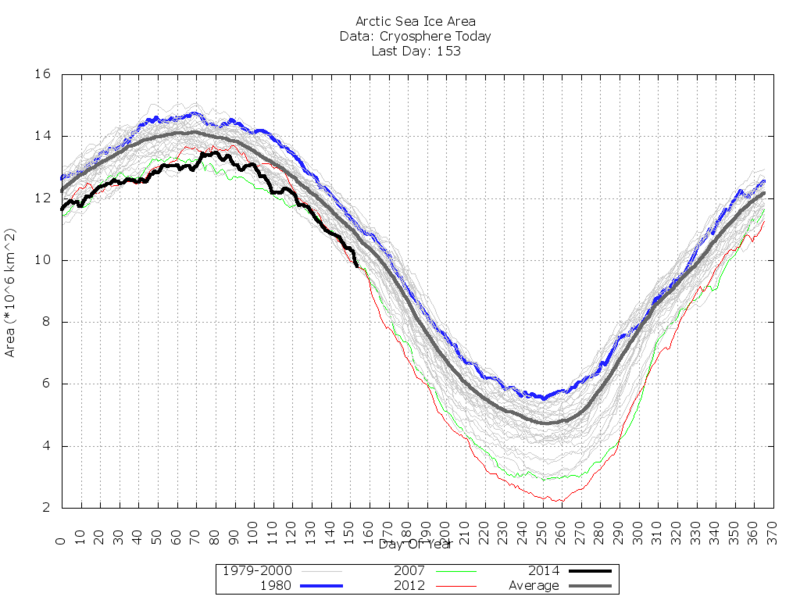 Alot of speculation on arctic sea ice blog about whether 2012 or 2013 is a guide for what is happening. There was also some commentary about a possible cyclone I think coming from the siberian side – however, have not seen any updated comments on this. Have the jetstream patterns become set or are they still meandering around? Just trying to get some idea of the synoptic patterns in operation at the moment and whether they are indicating a stuck (fixed) or variable pattern as we enter the start of the melt season. I appreciate the information you include in your blogs. Some trends, but we’re still looking for the signal. The synoptic ridge off the west coast moves north. This appears to be enforcing the Beaufort high. The hot water pool in that zone creates a kind of strong atmospheric slot for this to enhance as summer builds. The Greenland high appears well established, a variable that appears to have the potential to intensify. The Caspian high appears established, though somewhat wobbly. All these ridge influences should expand north as summer progresses. Ridge building over Yakutia, East Siberian and Laptev, trough from west Laptev to the Kara also seems potential (Kara trough ongoing for weeks). Numerous instances of continental or ocean air crossing the Arctic. Tendency of south to north wind through the Chukchi. Tendency of north to south wind over Fram Strait, Svalbard, Barents. I don’t think this is like 2012 or 2013. Temps in Bangalore have been consistently 2-5 degrees C above long term average temps since February. The June average high is 30 C and the forecast for the next 10 days is 32-33, and that with the daily chance of thunderstorms. Andy in Bangalore’s Exponential Law: By the time exponential change is noticeable in natural systems programs will have no effect on the outcome. Andy in Bangalore’s Modeling Natural Systems Law: Describing natural systems with math while making them “manageable” fails to address what is most important which is the inherently unpredictable nature of such systems. Andy in Bangalore’s Exponential Law: By the time exponential change is noticeable in natural systems programs will have no effect on the outcome. – good one Andy. Perhaps Robert here will expound a “Robert’s Rules” of climate change in a future article! More like a guide. Rules tend to break a bit too easily for my tastes. As global temperature continues to increase, extreme weather records keep tumbling across Australia. Now the exceptional heat has continued into the autumn of 2014. The average temperature for April 2014 was 1.11 oC above the long-term average, and continuation of abnormally warm temperatures into late May has delayed the onset of winter conditions across southern Australia. A remarkable, prolonged warm spell occurred over the period 8-26 May, with daytime temperatures 4 to 6 oC above normal over much of south-central Australia, extending from South Australia and northwest Victoria into Queensland and the Northern Territory. The 24-month period ending with April 2014 was the hottest two-year period on record, with an average temperature 1.16 oC above the long-term average, easily eclipsing the previous 24-month record set in the 2002-2004 period. Watching an enormous trade wind interruption from the Philippines all the way to mid ocean south of Hawaii. Low forming near Fiji. West winds all throughout eastern Pacific. Looks like this El Niño just took a leap forward. *Where* are you watching this Robert? It’s frustrating trying to find daily reports on the Pacific surface winds. I have long since ‘favourited’ half a dozen El Nino and Pacific weather related sites that I check daily but none of them are showing or mentioning this and Google reveals nothing. Can you, or anyone else, post me their favourite ‘real-time’ links in this regard. Google earth nullschool. Real time wind data from satellite observations. Have fun. Some 65 people died, mainly in Serbia and Bosnia, last month after the heaviest rainfall since records began more than a century ago caused rivers to burst their banks and triggered landslides. The floodwaters damaged farmland and energy infrastructure, and made a lake out of a large open-cast coal mine that feeds Serbia’s main power plant. The above is an interesting tidbit. Generally (and formerly), a good natural disaster is great for the economy of a developed nation. For example, the floods in CO last year caused a building boom that was good for unskilled labor, equipment operators, mechanics, and the construction trades. Same for the tornado that wiped out Moore, OK. (Except for the killed and maimed and their families) those tornadoes made everyone tickled. The insurance companies collected from the reinsurance companies, the citizens collected from the insurance companies, and money flowed – hurray!! Well, in Serbia it causes a recession. In Syria it caused a civil war. In Egypt a revolution followed by another revolution followed by adoption of a totalitarian regime that was welcomed/demanded by the people. In Thailand a military coup – some people are whining, but will eventually get used to it since most are happy. People like stability and (apologies to the “collapse aware”) demand economic growth. If that stability and growth is threatened in any credible way it seems that the majority will accept strict governmental controls which so far range from censorship – as in Canada (in relation to environmentalists) and perhaps in the US later (the military being unable to plan for AGW effects) – through complete military rule as in Egypt. The big weather problem happens, people suffer and at the same time have trouble getting petrol or heating fuel or electricity. Growth stops! (Oh, no!) People demand that growth is restarted and are generally thrilled when the government clamps down on the “trouble makers” (i.e. environmentalists, democracy buffs, liberals, etc.). Ok, maybe. But what happens when the dictator put in to make the economy work fails as he must since the problems are mostly structural? I will keep watching Egypt. I expect another revolution or a civil war. Obviously, these patterns if they are valid will be seen closer to home as things progress. If the problems are ignored, environmentalists are scape-goated, and authoritarian dictatorships wrap up all nations, then we all lose. It’s at that point when you start talking about possible human extinction. The current age is one of near misses. What this means is that damage is high, but not high enough to result in unrecoverable disruption. It’s like the beginning of World War II before the major carpet bombing campaigns started. Or like air battles for London. Terrible though these instances were, they generated more activity than they suppressed. Once we start getting a few big hits, people will look at things differently. So, yes, as bad as the Serbian floods, Sandy and Katrina were, they were still near misses. Heavy rain has triggered severe floods all the way from Central China to the south. In the tourist town of Fenghuang in Central China’s Hunan Province, torrential downpours have inundated streets, caused blackouts and traffic jams, and some of the town’s ancient sites have been submerged. In Hunan’s rural areas, about 300 landslides have been reported. The province’s authorities say that the floods have toppled 859 houses and affected some 586,000 residents. In Guangdong, thousands of people are trapped by rising flood waters in three villages in the city of Qingyuan, and rescue work is ongoing. Downpour battered Pingba County of southwest China’s Guizhou Province with rainfall reaching up to 188 millimetres as of Tuesday morning. The graphs you link to look a bit different in detail to the ones off the nsidc.org site, e.g. http://nsidc.org/arcticseaicenews/charctic-interactive-sea-ice-graph/ shows 2014 below 2012 for the last several months, while http://arctic.atmos.uiuc.edu/cryosphere/arctic.sea.ice.interactive.html has 2014 above 2012 recently. Do you know what the difference is between the two datasets? One measure is extent, the other area. Extent measures the total area of ice behind the ice edge, area measures the total coverage of ice, including holes in the ice behind the ice edge. A third measure, volume, takes into account the total thickness of ice as well as its area to achieve a measure in cubic kilometers (PIOMAS). THE worst HAILSTORMS since 1843 will smash into Britain THIS weekend, shocked experts warned today. The UK is about to be rocked by the most frenzied and chaotic start to summer EVER as monsoons and tornadoes rage in. Ice stones the ‘size of cricket balls’ will cause devastation across the country in what forecasters fear could be the the worst hailstorms since a deadly ‘supercell’ led to hailstones leaving craters FIVE FEET deep across England 171 years ago. Temperatures are expected to rocket to an incredible 91F (32.6C) by Saturday as a swathe of roasting hot air suddenly floods the British Isles. Heavy and persistent downpours will start today with parts of the south on alert for extreme flash floods. But the really dramatic weather will start on Friday night when two ‘battling’ weather systems will fight it out over Britain. The resulting carnage will trigger tornadoes and fierce winds, enormous hailstorms and potentially DEADLY lightning strikes. The Met Office has issued a severe weather warning across virtually the entire country on Saturday and warned of major travel disruption. Will be interesting to see if it eventuates. There were some skeptical comments in the comments to the article in the link provided above and I did not see any warnings flashing on the UK MET or BBC web-sites. I wonder if this has crept up on everyone or had there been some previous forecasts for bad weather, but just not as extreme. I am told they hoax this stuff almost weekly . Yeah – it’s The Express. It’s sort of a tradition with them to make up extreme weather events. They are famous for it. Why they do it I don’t know – it must improve sales I guess or maybe it’s a long-standing joke. British papers can be pretty eccentric and The Express is one of the worst offenders. There might be something to it but I doubt it. Yup, never trust anything that you read in the Daily Express – especially about the weather! GUIYANG, June 3 (Xinhua) — Two people have been killed and two others are missing after a new round of rainstorms in south China. The heaviest precipitation was 200.5 mm in Tongzhi County from 8 a.m. on Monday to 8 a.m. Tuesday. Water in the local Tongzhi river rose to 1.14 meters above warning levels. “Hospitals across Japan treated 1,637 people for heatstroke last week, including four fatalities, the Fire and Disaster Management Agency said Tuesday…. More than 40 percent of those hospitalized were 65 or older. We lose our sense of overheating as we age. Lots of trouble for those of us in that age-range in previous major heatwaves as well. A heat wave that hit Moscow on Wednesday broke a 117-year-old weather record, forecasters said. Temperatures in the capital reached 28.6 degrees Celsius by 1 p.m. and broke the city’s record temperature for June 4, Russia’s meteorological center said on its website. On this day in 1897, Moscow recorded a temperature of 27.9 degrees C.
The meteorological center earlier said that temperatures could reach between 28 and 30 degrees C.
Muscovites will have the opportunity to bask in the sun for the rest of the week, as temperatures are expected to reach up to 31 degrees C on Friday and Saturday, the weather agency said Wednesday on its website. The record for June 5 is 30.4 degrees C, set in 1988. And here we go with the Caspian high. Moving North! Watch out for heatwaves/droughts/fires for this region this year. When then temperatures rise quickly in spring you get the snow pack melting extremely quickly and not soaking into the ground. Colorado is seeing this now. This will deplete the snow pack fast, disallow moisture seepage into the soil, causing reduced flow in streams and rivers earlier in the summer. Could be a rough fire season. Huge problem and one of the reasons we see so many more fires worldwide. 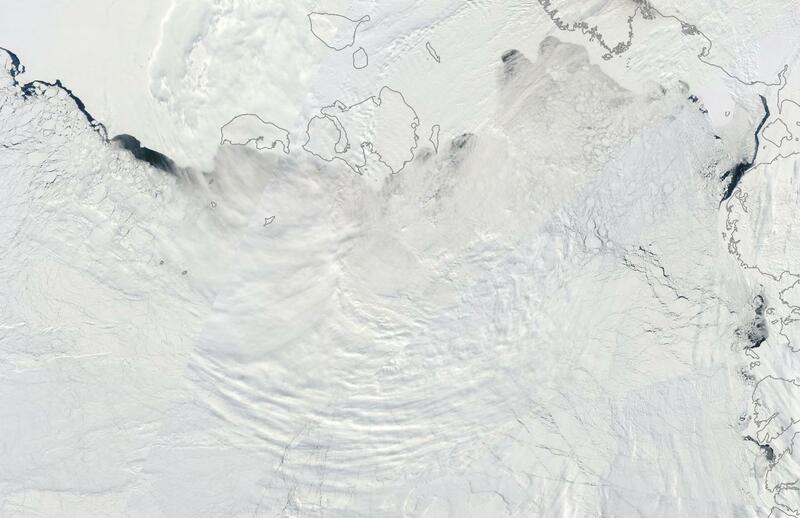 And Cryosphere Today reports another big dump: Area, 9.805 million sq. km. Anomaly, .998 million sq. km. Appears ahead, year-to-date of record 2012…..
Make that: Anomaly .988 million sq. km. Make that: .988 million sq. km. anomaly… a big one regardless. One of the world’s longest-running ecological studies has revealed that Amazonian forests are being altered by multiple environmental threats – creating even greater perils for the world’s largest rainforest. “It’s like a boxer getting hit by a flurry of punches,” says lead author William Laurance of James Cook University in Cairns, Australia. For the past 35 years, a team of Brazilian and international researchers has studied how diverse communities of trees and vines respond when the Amazonian rainforest is fragmented by cattle ranching. The fragmented forests, they found, change rapidly. “Lots of trees have died while vines, which favour disturbed forests, proliferate rapidly,” said Jose Luis Camargo of Brazil’s National Institute for Amazonian Research. But the biggest surprise is that nearby undisturbed forests, which were also being carefully studied, changed as well. Trees there grew and died faster, and the vines also multiplied. Oh man is that a fire hazard. You and Rachel Carson both. I read about the decline in sea ice in her amazing 1955 book ‘The Edge of the Sea’ when I was a child. When I grew older, it came as a shock to me that sea ice loss was a controversial issue, since it was clear to me we’d been observing it happen for so long. Just found your update, Robert. Man, you’re fast! Have to be now. Lots going on! School canceled, roads and power cut in Southern Chile as agriculture and hydroelectric sectors hope El Niño will end five years of drought. If reference links are included, please feel free. Warmest regards and best wishes.